The first in the range of Mitsubishi 4G9x engines is the 4G91 which uses a 78.4mm bore and 77.5mm stroke for a total displacement of 1.5 litres. With a 9.5:1 compression ratio and DOHC, four-valve-per-cylinder head and multi-point EFI, this engine puts out a creditable 84kW at 6000 rpm and 135Nm at 5000 rpm on normal unleaded fuel. 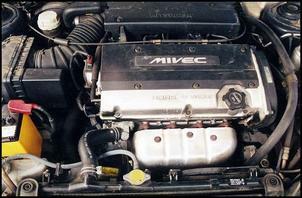 The engine can be found in the Japanese market ’91 top-line Lancer and Mirage/Mirage Asti. A low output carby version was also produced but it’s not likely you’re interested in that... Both engines are designed for transverse mounting and are available with a four-speed auto or five-speed manual ‘box. Most examples are front-wheel-drive but, curiously, an all-wheel-drive carby version was also produced. This engine lasted only until the mid ‘90s. Based on the original 4G91 1.5-litre engine is the 4G92 1.6-litre which appeared from late 1991. The 4G92 achieves its extra capacity thanks to a slightly larger 81mm bore and, released in the late 1991 Japanese spec Mirage RS and Super R (later known as the Mirage R), it is quite highly tuned. With an 11:1 compression ratio necessitating the use of premium unleaded, the DOHC 4G92 generates a healthy 107kW at 7000 rpm and 149Nm at 4500 rpm. This engine is available in manual or auto, FWD or AWD. Production of this engine ended in around 1993, but that’s no great loss given its long-term replacement – the firecracker 4G92 MIVEC! One of the most powerful Mitsubishi atmo fours (and one of our all-time favourites) is the 4G92 MIVEC as found in the Japanese market ’92 Lancer MR, Mirage Cyborg/VR and hi-po post-‘94 Mirage Asti models. This wonderful little engine employs an 11:1 compression ratio and benefits from MIVEC variable valve timing and lift. Output is a VTEC-whipping 129kW at 7500 rpm and 167Nm at 7000 rpm - as you can probably tell, this is an engine that loves to rev! The 4G92 MIVEC engine is available with a five-speed manual or a four-speed auto (with Sports Mode sequential shift from late 1995). Drive is to the front wheels only. Interestingly, a Modular Displacement (MD) version of the 4G92 MIVEC was also produced – MD is Mitsubishi’s cylinder deactivation system which helps improve fuel consumption. It appears this option was available for only a few years. The conventional 4G92 MIVEC was manufactured until around 2000. The third and final member of the 4G92 family, and by far the least spectacular, is the SOHC version available in the late ’96 Japanese spec Mitsubishi Libero wagon. With a 9.5:1 compression ratio allowing the use of normal unleaded fuel, the SOHC 4G92 makes just 81kW/142Nm. A manual or auto gearbox is attached to these FWD-only engines. While the revvy 1.6-litre 4G92 was flourishing, Mitsubishi also introduced the larger capacity 4G93 engine which – thanks to a longer 89mm stroke – displaces 1.8-litre. 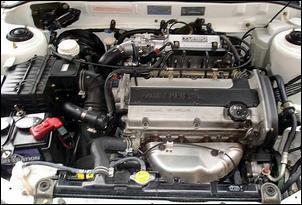 The earliest application for this engine was in the Japanese RVR wagon of 1991. With a SOHC, four-valve-per-cylinder head, multi-point injection and a 9.5:1 compression ratio you’re looking at a lazy 88kW and 159Nm. The RVR’s 4G93 comes in either FWD or AWD guise and with a manual or auto trans. Later in 1991, Mitsubishi released a high performance version of the 1.8-litre 4G93 – but, this time, turbocharging was used rather than MIVEC technology. With the switch to a DOHC head and an 8.5:1 static compression ratio, the 4G93T is equipped with a single TD04 turbocharger and air-to-air intercooler to deliver 143kW at 6000 rpm and 270Nm at 3000 rpm. Premium fuel is essential to achieve this output. The 4G93T was released in the late ’91 Lancer GSR and RS sedan – both with AWD and a five-speed manual ‘box. An auto version was released in the GSR during 1992. 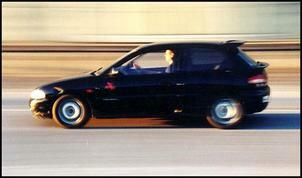 A higher output incarnation of the 4G93T was released during 1994 in the snout of the Japanese market Libero GT wagon. With a higher static compression ratio (9:1), the Libero turbo engine is rated ahead of the earlier Lancer version – there’s 151kW and 275Nm at 6000 and 3000 rpm respectively. An auto or manual gearbox is available and all Libero GTs provide AWD. Note that the Lancer GSR/RS adopted the identical 151kW spec engine at the same time the Libero GT appeared. In 1995, the new Mirage VR-X AWD became the third model to receive the 151kW engine but, by this time, the Libero GT had been upgraded to 158kW/284Nm. The Lancer GSR (the RS now dropped) remained at 151kW. 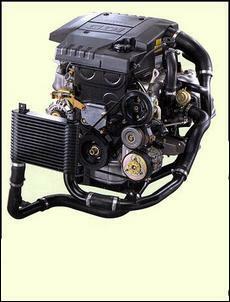 Fortunately, most small/medium size Mitsubishis of the mid ‘90s use an EFI – but still SOHC – version of the 4G93 similar to that found in the RVR. This engine makes 85 – 92kW. A little bit of spark appeared in late 1994 with a DOHC atmo version of the 4G93 in the Libero Vienta II and Eterna Visage S/Touring. With the compression ratio remaining at a sane 9.5:1, the DOHC 4G93 makes 103kW and 167Nm at 6500 and 5000 rpm respectively. Respectable but nothing more. The next biggest change came in mid 1996 with the release of the Mitsubishi Legnum wagon and mid-spec versions of the Galant. The Legnum/mid-spec Galant benefits from Mitsubishi’s new GDI (direct injection) system and an accompanying compression ratio increase – to 12:1! With premium unleaded fuel in the tank, this engine puts out 110kW at 6500 rpm and 178Nm at 5000 rpm. Given the ultra-lean air-fuel ratios possible with the GDI system, fuel consumption is also considerably improved over comparable multi-point injected 4G93s. Five-speed manual and Sports Mode sequential four-speed auto versions appeared in FWD models and an AWD option was released. Meanwhile, a new sedan model – the Carisma – was released with the availability of a Sports Mode auto but the engine is nothing more than an updated SOHC 4G93. The GDI engine was introduced the following year – its output is 103kW/181Nm. Interestingly, it appears the Legnum and mid-spec Galant GDI models also slid from 110kW to 103kW during 1997. 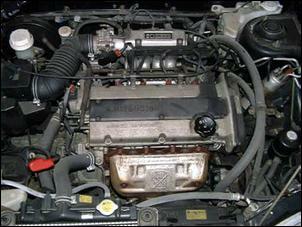 A Sports Mode auto then appeared in the 1997 RVR which also received an upgrade to the GDI engine. In RVR spec, the GDI 4G93 outputs a mild 103kW/181Nm. A FWD or AWD version is available. The slightly odd 1998 Pajero io was the next model to come with GDI. In io guise, the GDI 4G93 generates just 96kW at 5500 rpm and 181Nm at 3500 rpm. Most are four-speed autos but a five-speed manual is available. The Pajero io is part-time 4WD or RWD. In ’98, a newly introduced Mitsubishi Aspire model took over from the Carisma sedan – again, there was the 103kW GDI engine, Sports Mode auto and FWD or AWD. The same year, the Legnum and Galant GDI models were released with a ‘quiet exhaust’ specification which dropped power to 99kW. 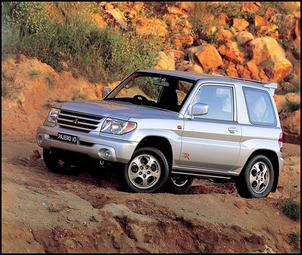 Finally, the combination of GDI and turbocharging was married in the 2000 model Pajero io. With a relatively high 10:1 static compression ratio, the engine uses a single turbocharger and air-to-air intercooler to generate a sedate 118kW at 5200 rpm and 220Nm at 3500 rpm. These engines are auto-only and part-time 4WD. See Mitsubishi's Direct Injection Turbo 1.8 for more info on the 4G93 GDI turbo engine. Also in 2000, the Lancer Cedia sedan and wagon were released with an atmo GDI 4G93 making 96kW at 6000 rpm and 177Nm at 3750 rpm (using premium unleaded). Front-wheel-drive and all-wheel-drive models were produced, both having a CVT. The Japanese market Dingo van also appeared in 2000 with a 4G63 GDI donk. However, with a lowered 11.6:1 compression ratio, output is 99kW/181Nm. As far as we’re aware, these come with a front-wheel-drive four-speed auto transaxle – no manuals available. 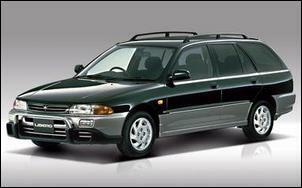 In 2001, the GDI/turbo combo reappeared in certain Lancer Cedia wagon models. In Lancer spec, these engines make 121kW at 5500 rpm and 220Nm at 3500 rpm. Attached is a four-speed Sports Mode auto providing drive to the front wheels only. The same engine was then introduced in the 2002 Mitsubishi Dion van which was sold with FWD or AWD. Oh and, finally, we must mention the big banger of the 4G9x line-up. 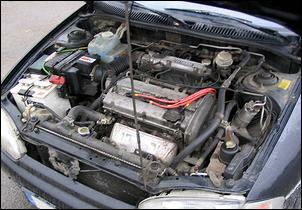 In 2000, Mitsubishi released a further stroked and slightly bored version of the engine displacing 2 litres. The new 4G94 comes with a DOHC head, GDI and an 11:1 compression ratio and can be found in the 2000 Mitsubishi Aspire, Legnum, Galant, Dion and Pajero io. The engine makes 107kW at 5700 rpm and 191Nm at 3750 rpm in the Aspire, Legnum and Galant while you get just 99-100kW in Dion and Pajero io models. Interestingly, the Pajero io is the only model with the combination of a 4G94 GDI engine and a five-speed manual gearbox (with part-time 4WD). You’ll also find SOHC non-GDi versions of the 2-litre 4G94 in vehicles such as the 2002 Lancer and Pajero io – but with just over 90kW they needn’t be high on your shopping list.